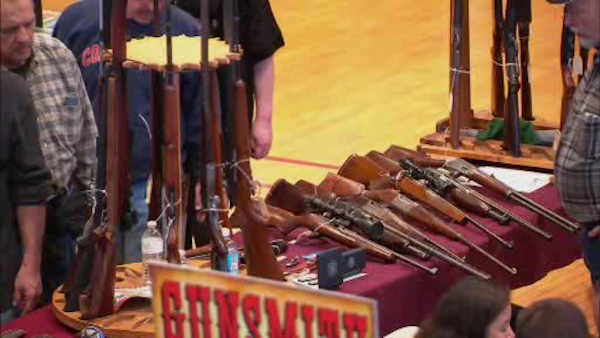 WHITE PLAINS, New York (WABC) -- A gun show in Westchester County is continuing for a second straight day despite efforts to ban it. Westchester County Executive Robert Astroino vetoed a measure passed by the county legislature banning all gun shows on county property the day before the show. Lawmakers had passed the bill 9-8 earlier this month. Astorino says there was no legal explanation for the proposed ban. Hundreds of people attended the gun and knife show Saturday. The Journal News reports that long lines were wrapped around the side of the Westchester County Center. The gun show is the first at the County Center in White Plains since 2012. Astorino canceled a February 2013 show following the fatal shootings at Sandy Hook Elementary School in Newtown, Connecticut. The president of the group that runs the show said gun collectors pose no threats to anyone. Newman Chittenden of Westchester Collectors Inc. called the gun show "one of the most wholesome activities there is." Chittenden said as many as 5,000 people are expected to attend the show.